You know when you read something and your brain just goes WHOOSH in an Eli Cash - Royal Tenenbaums "Pew....wildcat" kind of way? "Getting rid of the clutter, excess, and all the things that were distracting me, made room to figure out what I wanted. I wanted freedom. Freedom from the things that weighed me down, and freedom to want what I wanted and time to do what it took to get it, and enjoy and appreciate it." Nothing hidden (shoes live separately - a post for another day). Nothing in the wash. The TOP top shelf holds a bag with my swimming gear. Next to that, a bag with a few Winter hats (my ears protest wind) and a pair of gloves. To the right of that, my "I'm not ready to let go of these/maybe I will wear these sometime" pile. The top shelf holds a bag with two woolen Winter jerseys, and another bag with some transition season lighter cardigans. The first of the smaller shelves holds my yoga teaching gear and workout wear. One shelf down holds undies and pyjama sets. The 2nd last shelf holds my basics: 2 pairs of jeans, 2 denim skirts (1 midi + 1 maxi), 2 pairs of denim shorts and 4 good-quality t-shirts that can be dressed up or dressed down with accessories (1 in red + black + blue + white). The bottom shelf holds socks and slippers in a basket. Hanging: 2 heavy Winter coats + 2 fitted blazers + 1 linen jacket + 1 soft-shell + some scarves/pashminas + 4 dresses + 2 cotton skirts + 3 collared cotton shirts. I used to wear only a small portion of my clothes over and over again. Boring. I hung on to clothing for far too long - items I had worn in my teens and twenties (I have been the same dress size since the 10th grade). Although the size still fits, the style no longer does. Honesty in this regard is vital for this process to work. People change. Roll with it. I cared less about the quality of the garments, and wore my favourites (that were actually LESS my favourites and more just sloppy convenience), even when the quality had deteriorated with fading/piling/small holes in the fabric. I am now aspiring to Jennifer L. Scott's lesson from Madame Chic about using only your best, and I am liking the results. I am far less overwhelmed when opening my cupboard because I have so much less to go through. Part of trying EVERYTHING on during the paring down phase was also making matching outfits. I now know what goes with what, thereby putting an end to the: "I have nothing to wear" in a closet FULL of clothes conundrum. Tips for decluttering and paring down minimalist-style. The Minimalists' post: What things can you get rid of? 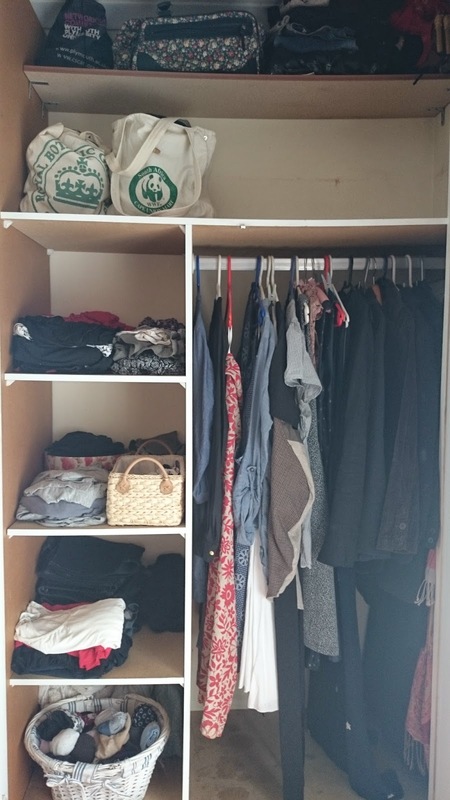 The duo from New Minimalism's post: The 7 most important questions to ask yourself when decluttering and their 3-part series on closet clearing. The Minimalist Packrat's posts: 6 Steps for getting control over your clothes and a minimalist take on clothing. Courtney Carver's (of Be More With Less and Project 333): 7 simple truths about dressing with less.